The Daytona 675 was the first 3-cylinder super sports middleweight and has been very highly rated in this extremely competitive class. The 675cc, liquid cooled 3-cylinder engine is very compact and is rated at 123 hp at 12,500 rpm with 53 ft. lbs. of torque at 11,750 rpm. The standard 3 into 1 underseat exhaust uses a secondary valve to boost low-end torque. With the close ratio six speed transmission riding at a casual or spirited pace should be enjoyable. 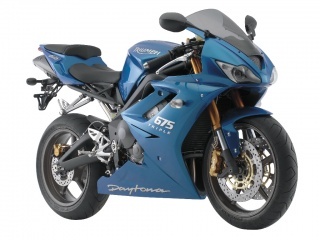 The Nissin 4 piston radial calipers and 308mm dual disks up front, single piston and 220mm disc in the rear should be a balanced match for the powerful Daytona 675. A Triumph 675 fan posing for RoadCarvin'. 2008 Buell 1125R in turn 4.